The Bactria–Margiana Archaeological Complex (short BMAC), also known as the Oxus civilization, is the modern archaeological designation for a Bronze Age civilization of Central Asia, dated to c. 2400–1600 BC, located in present-day northern Afghanistan, eastern Turkmenistan, southern Uzbekistan and western Tajikistan, centred on the upper Amu Darya (Oxus River). Its sites were discovered and named by the Soviet archaeologist Viktor Sarianidi (1976). Bactria was the Greek name for the area of Bactra (modern Balkh), in what is now northern Afghanistan, and Margiana was the Greek name for the Persian satrapy of Marguš, the capital of which was Merv, in modern-day southeastern Turkmenistan. Sarianidi's excavations from the late 1970s onward revealed numerous monumental structures in many sites, fortified by impressive walls and gates. Reports on the BMAC were mostly confined to Soviet journals until the last years of the Soviet Union, so the findings were largely unknown to the West until Sarianidi's work began to be translated in the 1990s. 4.1 Evidence for a BMAC substratum in Indo-Iranian? There is archaeological evidence of settlement in the well-watered northern foothills of the Kopet Dag during the Neolithic period. This region is dotted with the multi-period hallmarks characteristic of the ancient Near East, similar to those southwest of the Kopet Dag in the Gorgan Plain in Iran. At Jeitun (or Djeitun), mud brick houses were first occupied c. 6000 BC. The inhabitants were farmers who kept herds of goats and sheep and grew wheat and barley, with origins in southwest Asia. Jeitun has given its name to the whole Neolithic period in the northern foothills of the Kopet Dag. At the late Neolithic site of Chagylly Depe, farmers increasingly grew the kinds of crops that are typically associated with irrigation in an arid environment, such as hexaploid bread wheat, which became predominant during the Chalcolithic period. During the Copper Age, the population of this region grew. Archaeologist Vadim Mikhaĭlovich Masson, who led the South Turkmenistan Complex Archaeological Expedition from 1946, sees signs that people migrated to the region from central Iran at this time, bringing metallurgy and other innovations, but thinks that the newcomers soon blended with the Jeitun farmers. (Vadim was the son of archaeologist Mikhail Masson, who already started work in this same area previously.) By contrast a re-excavation of Monjukli Depe in 2010 found a distinct break in settlement history between the late neolithic and early chalcolithic eras there. 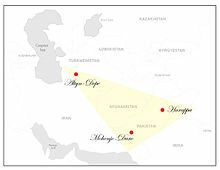 Altyn-Depe location on the modern Middle East map as well as location of other Eneolithic cultures (Harappa and Mohenjo-daro). Major chalcolithic settlements sprang up at Kara-Depe and Namazga-Depe. In addition, there were smaller settlements at Anau, Dashlyji, and Yassy-depe. Settlements similar to the early level at Anau also appeared further east– in the ancient delta of the river Tedzen, the site of the Geoksiur Oasis. About 3500 BC, the cultural unity of the area split into two pottery styles: colourful in the west (Anau, Kara-Depe and Namazga-Depe) and more austere in the east at Altyn-Depe and the Geoksiur Oasis settlements. This may reflect the formation of two tribal groups. It seems that around 3000 BC, people from Geoksiur migrated into the Murghab delta (where small, scattered settlements appeared) and reached further east into the Zerafshan Valley in Transoxiana. In both areas pottery typical of Geoksiur was in use. In Transoxiana they settled at Sarazm near Pendjikent. To the south the foundation layers of Shahr-i Shōkhta on the bank of the Helmand river in south-eastern Iran contained pottery of the Altyn-Depe and Geoksiur type. Thus the farmers of Iran, Turkmenistan and Afghanistan were connected by a scattering of farming settlements. In the Early Bronze Age the culture of the Kopet Dag oases and Altyn-Depe developed a proto-urban society. This corresponds to level IV at Namazga-Depe. Altyn-Depe was a major centre even then. Pottery was wheel-turned. Grapes were grown. The height of this urban development was reached in the Middle Bronze Age c. 2300 BC, corresponding to level V at Namazga-Depe. It is this Bronze Age culture which has been given the BMAC name. The inhabitants of the BMAC were sedentary people who practised irrigation farming of wheat and barley. With their impressive material culture including monumental architecture, bronze tools, ceramics, and jewellery of semiprecious stones, the complex exhibits many of the hallmarks of civilisation. The complex can be compared to proto-urban settlements in the Helmand basin at Mundigak in western Afghanistan and Shahr-e Sukhteh in eastern Iran, or at Harappa and Mohenjo-daro in the Indus Valley. Models of two-wheeled carts from c. 3000 BC found at Altyn-Depe are the earliest complete evidence of wheeled transport in Central Asia, though model wheels have come from contexts possibly somewhat earlier. Judging by the type of harness, carts were initially pulled by oxen, or a bull. However camels were domesticated within the BMAC. A model of a cart drawn by a camel of c. 2200 BC was found at Altyn-Depe. Sarianidi regards Gonur as the "capital" of the complex in Margiana throughout the Bronze Age. The palace of north Gonur measures 150 metres by 140 metres, the temple at Togolok 140 metres by 100 metres, the fort at Kelleli 3 125 metres by 125 metres, and the house of a local ruler at Adji Kui 25 metres by 25 metres. Each of these formidable structures has been extensively excavated. While they all have impressive fortification walls, gates, and buttresses, it is not always clear why one structure is identified as a temple and another as a palace. Mallory points out that the BMAC fortified settlements such as Gonur and Togolok resemble the qila, the type of fort known in this region in the historical period. They may be circular or rectangular and have up to three encircling walls. Within the forts are residential quarters, workshops and temples. The people of the BMAC culture were very proficient at working in a variety of metals including bronze, copper, silver, and gold. This is attested through the many metal artefacts found throughout the sites. Extensive irrigation systems have been discovered at the Geoksiur Oasis. The discovery of a single tiny stone seal (known as the "Anau seal") with geometric markings from the BMAC site at Anau in Turkmenistan in 2000 led some to claim that the Bactria-Margiana complex had also developed writing, and thus may indeed be considered a literate civilisation. It bears five markings which are similar to Chinese "small seal" characters. The only match to the Anau seal is a small jet seal of almost identical shape from Niyä (near modern Minfeng) along the southern Silk Road in Xinjiang, assumed to be from the Western Han dynasty. There is evidence of sustained contact between the BMAC and the Eurasian steppes to the north, intensifying c. 2000 BC. In the delta of the Amu Darya where it reaches the Aral Sea, its waters were channelled for irrigation agriculture by people whose remains resemble those of the nomads of the Andronovo culture. This is interpreted as nomads settling down to agriculture, after contact with the BMAC, known as the Tazabagyab culture. About 1800 BC, the walled BMAC centres decreased sharply in size. Each oasis developed its own types of pottery and other objects. Also pottery of the Tazabagyab-Andronovo culture to the north appeared widely in the Bactrian and Margian countryside. Many BMAC strongholds continued to be occupied and Tazabagyab-Andronovo coarse incised pottery occurs within them (along with the previous BMAC pottery) as well as in pastoral camps outside the mudbrick walls. In the highlands above the Bactrian oases in Tajikistan, kurgan cemeteries of the Vaksh and Bishkent type appeared with pottery that mixed elements of the late BMAC and Tazabagyab-Andronovo traditions. In southern Bactrian sites like Sappali Tepe too, increasing links with the Andronovo culture are seen. 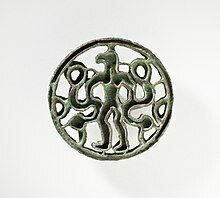 During the period 1700 - 1500 BCE, metal artifacts from Sappali Tepe derive from the Tazabagyab-Andronovo culture. The Bactria-Margiana complex has attracted attention as a candidate for those looking for the material counterparts to the Indo-Iranians (Aryans), a major linguistic branch that split off from the Proto-Indo-Europeans. Sarianidi himself advocates identifying the complex as Indo-Iranian, describing it as the result of a migration from southwestern Iran. Bactria–Margiana material has been found at Susa, Shahdad, and Tepe Yahya in Iran, but Lamberg-Karlovsky does not see this as evidence that the complex originated in southeastern Iran. "The limited materials of this complex are intrusive in each of the sites on the Iranian Plateau as they are in sites of the Arabian peninsula." According to recent studies  BMAC was not a primary contributor to later South-Asian genetics. Evidence for a BMAC substratum in Indo-Iranian? As argued by Michael Witzel and Alexander Lubotsky, there is a proposed substratum in Proto-Indo-Iranian which can be plausibly identified with the original language of the BMAC. Moreover, Lubotsky points out a larger number of words apparently borrowed from the same language, which are only attested in Indo-Aryan and therefore evidence of a substratum in Vedic Sanskrit. 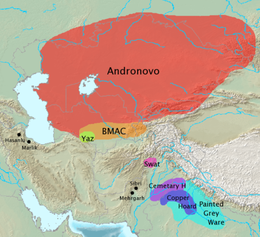 He explains this by proposing that Indo-Aryan speakers probably formed the vanguard of the movement into south-central Asia and many of the BMAC loanwords which entered Iranian may have been mediated through Indo-Aryan. :306 Michael Witzel points out that the borrowed vocabulary includes words from agriculture, village and town life, flora and fauna, ritual and religion, so providing evidence for the acculturation of Indo-Iranian speakers into the world of urban civilisation. Narasimhan et al. 2018 analyzed BMAC skeletons from the Bronze Age sites of Bustan, Dzharkutan, Gonur Tepe, and Sapalli Tepe. The male specimens belonged to haplogroup E1b1a (1/18), E1b1b (1/18), G (2/18), J* (2/18), J1 (1/18), J2 (4/18), L (2/18), R* (1/18), R1b (1/18), R2 (2/18), and T (1/18). Wikimedia Commons has media related to Bactria-Margiana Archaeological Complex. ^ E. g. Sarianidi, V. I. 1976. "Issledovanija pamjatnikov Dashlyiskogo Oazisa," in Drevnii Baktria, vol. 1. Moscow: Akademia Nauk. ^ Kohl 2007, pp. 189–190. ^ D. R. Harris, C. Gosden and M. P. Charles, "Jeitun: Recent excavations at an early Neolithic site in Southern Turkmenistan," Proceedings of the Prehistoric Society, 1996, vol. 62, pp. 423–442. ^ Naomi F. Miller, "Agricultural development in western Central Asia in the Chalcolithic and Bronze Ages," Vegetation History and Archaeobotany (1999) 8:13–19. ^ a b c d e V. M. Masson, "The Bronze Age in Khorasan and Transoxiana," chapter 10 in A. H. Dani and Vadim Mikhaĭlovich Masson (eds. ), History of civilizations of Central Asia, volume 1: The dawn of civilization: earliest times to 700 BCE (1992). ^ Reinhard Bernbeck et al., "A-II Spatial Effects of Technological Innovations and Changing Ways of Life," in Friederike Fless, Gerd Graßhoff, Michael Meyer (eds. ), Reports of the Research Groups at the Topoi Plenary Session 2010, eTopoi: Journal for Ancient Studies, Special Volume 1 (2011). ^ Monjukli Depe artefacts (in German). ^ Kohl 2007, pp. 186–187. ^ LB Kirtcho, The earliest wheeled transport in Southwestern Central Asia: new finds from Alteyn-Depe, Archaeology Ethnology and Anthropology of Eurasia, vol. 37, no. 1 (2009), pp. 25–33. ^ a b c C.C. Lamberg-Karlovsky, "Archaeology and Language: The Indo-Iranians", Current Anthropology, vol. 43, no. 1 (Feb. 2002). ^ Mallory & Adams 1997, p. 72. ^ John Colarusso, Remarks on the Anau and Niyä Seals, Sino-Platonic Papers, no. 124 (August 2002), pp. 35–47. ^ Kohl 2007, Chapter 5. ^ a b David Anthony, The Horse, the Wheel and Language (2007), pp.452–56. ^ Kaniuth, Kai (2007). "The metallurgy of the Late Bronze Age Sappali Culture (southern Uzbekistan) and its implications for the 'tin question'". Iranian Antiqua. 42. doi:10.2143/IA.42.0.2017869. ^ Mallory & Adams 1997, p. 73. ^ a b Witzel, Michael (2003). "Linguistic Evidence for Cultural Exchange in Prehistoric Western Central Asia". Sino-Platonic Papers (129). Kohl, Philip L. (2007). The Making of Bronze Age Eurasia. Cambridge Universy Press. ISBN 1139461990. Mallory, J. P.; Adams, D. Q. (1997). "BMAC". Encyclopedia of Indo-European Culture. London: Fitzroy Dearborn. ISBN 1-884964-98-2. Parpola, Asko (2015). The Roots of Hinduism: The Early Aryans and the Indus Civilization. Oxford University Press Incorporated. ISBN 0190226927. Lubotsky, A. (2001). "Indo-Iranian substratum" (PDF). In Carpelan, Christian (ed.). Early Contacts between Uralic and Indo-European. Helsinki: Suomalais-Ugrilainen Seura. ISBN 952-5150-59-3. Archived from the original (PDF) on 2008-04-11. Sarianidi, V. I. (1994). "Preface". In Hiebert, F. T. (ed.). Origins of the Bronze Age Oasis Civilization of Central Asia. Cambridge: Harvard University Press. ISBN 0-87365-545-1. Sarianidi, V. I. (1995). "Soviet Excavations in Bactria: The Bronze Age". In Ligabue, G.; Salvatori, S. (eds.). Bactria: An ancient oasis civilization from the sands of Afghanistan. Venice: Erizzo. ISBN 88-7077-025-7. This page was last edited on 28 March 2019, at 18:46 (UTC).